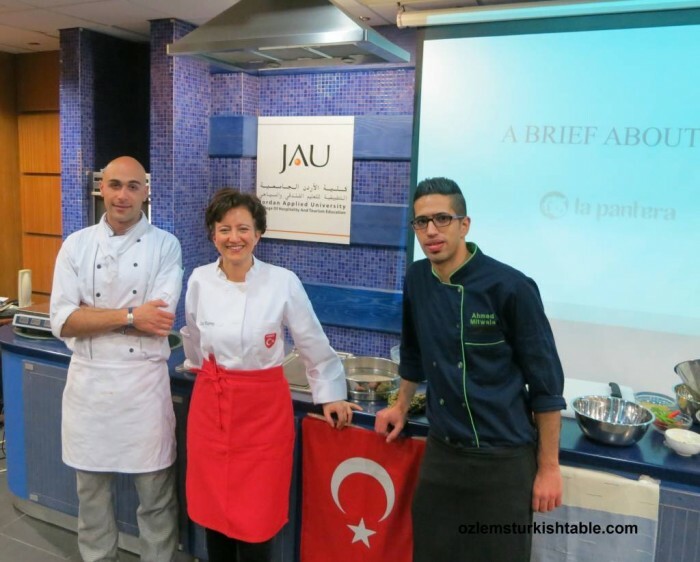 I have just returned from an amazing trip to Amman, Jordan; I was in Amman last week to teach a 5 day Turkish cookery course at JA University, a wonderful experience from the start to the end, very kindly organised by Panthera Jordan with a much appreciated support by the Turkish Embassy in Amman, Jordan. 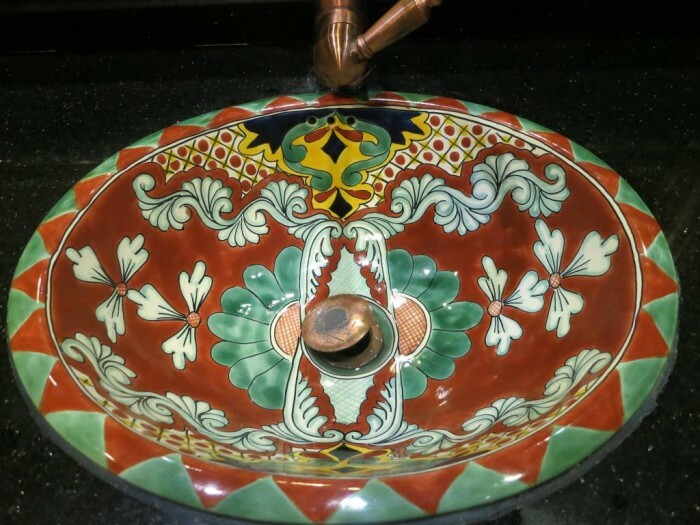 There has been so many highlights from our course, here I wanted to share a few with you. 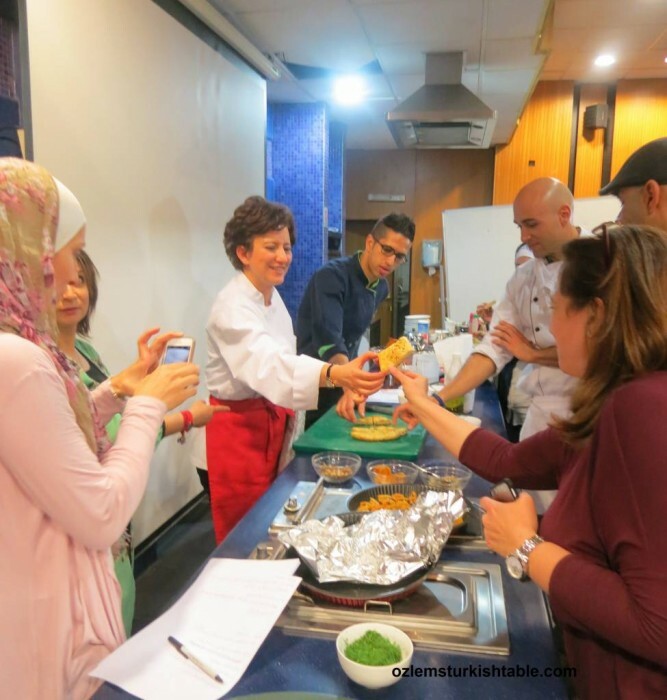 During our 5 day course, we covered 22 recipes; from Spinach and feta filo pastry, Ispanakli Borek and pastries to salads, vegetables cooked in olive oil, Zeytinyaglis to mezzes, to kebabs to desserts and drinks. It was great to hear the participants very much enjoyed the freshness of our dishes, based on seasonality, ease of making and lightness in flavor as well as being wholesome. 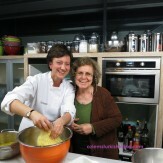 They expressed they loved the vegetarian courses we made as much as the meat based dishes. 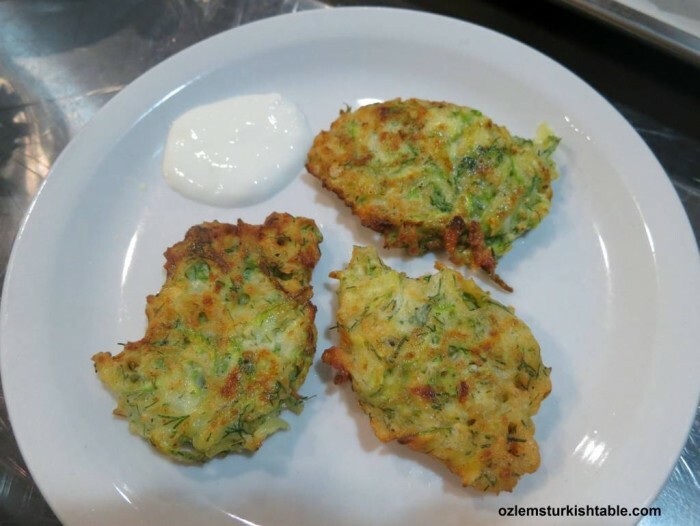 I aimed to try to show them what is cooked and enjoyed in Turkish homes as well as some classic Turkish dishes; from Mucver – Zucchini fritter with feta and dill to Ispanakli borek to Patlicanli Mualla, Eggplants, lentils and peppers cooked in olive oil to Revani to Caramalised dried apricots with walnuts – Kuru Kayisi Tatlisi and more so they get a broader perspective of wholesome, delicious Turkish cuisine, beyond our much loved kebabs. 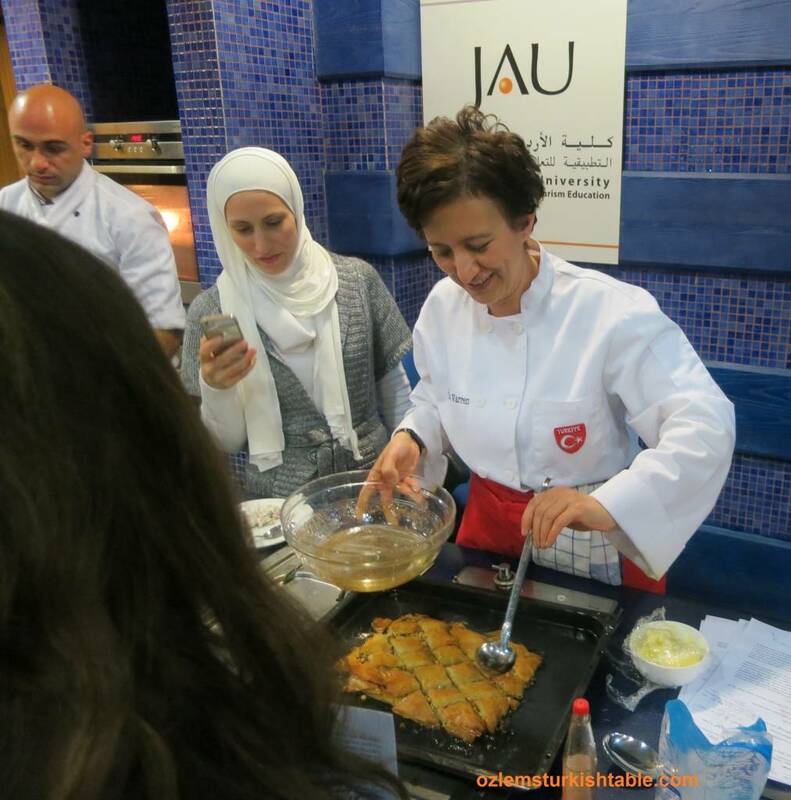 Teaching at the Jordan Applied University, JAU was very special; seeing the students’ as well as other participants – houseviwes, keen foodies, chefs from restaurants and hotels, as well as JAU students -enthusiasm and interest for the Turkish cusine, as the young chefs of the future. 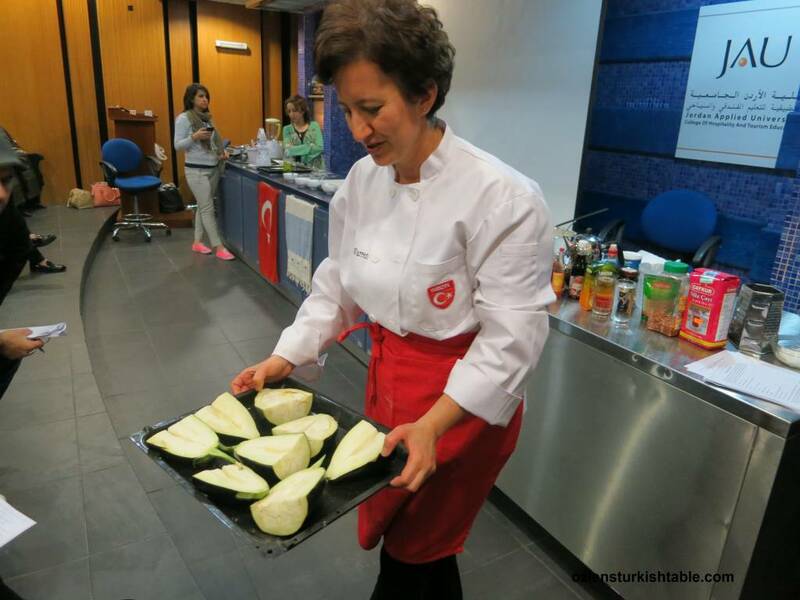 It really was a pleasure to have a chance to teach the delicious, wholesome, refreshing Turkish flavors to them and hearing they were inspired to enthusiastically make them straight after the class, showing me the photos of their creations. Making the Turkish pide bread was a special highlight from the class; bread is a major staple in Jordan too and it was interesting to compare notes of our flat bread and theirs. Fresh from the oven, it was much enjoyed. Our lighter baklava with walnuts, fragrant with lemon juice in syrup also hit the spot well. 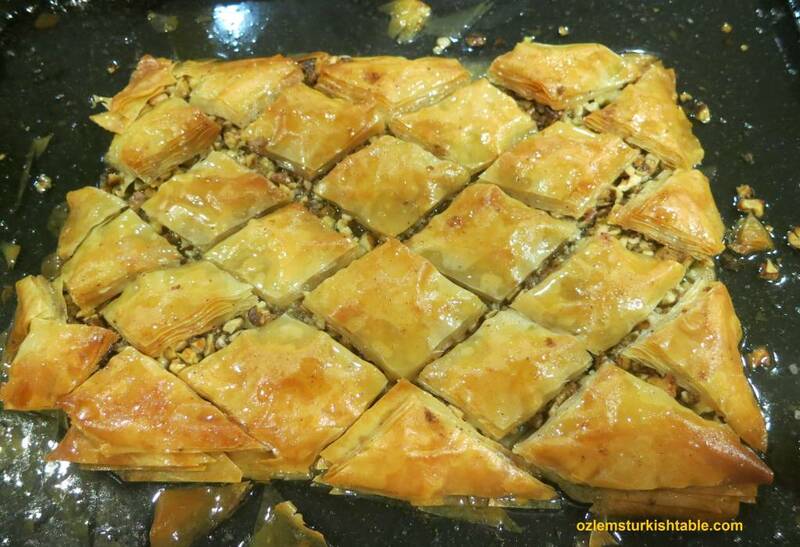 Baklava at home, in Turkey is much lighter than its versions abroad and glad to see it is received very well. I was delighted to see that the salads and vegetarian courses were very popular during our course. Zeytinyaglis, Vegetables Cooked in Olive Oil is a wholesome, delicious category in Turkish cuisine and a favorite with us. 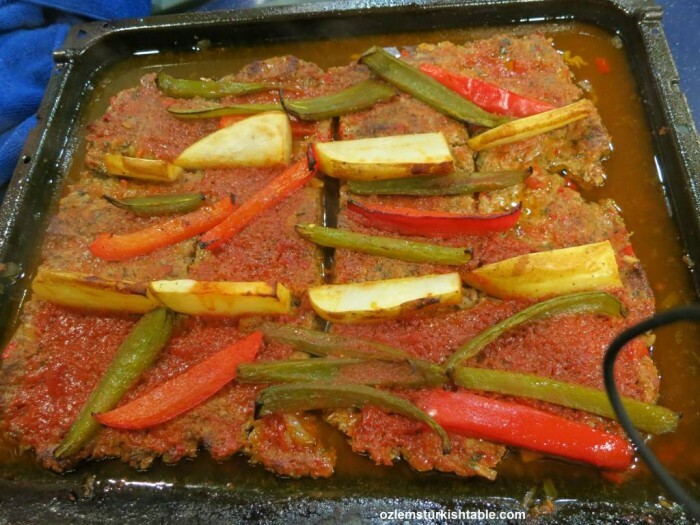 We made Antakya’s aubergines/eggplants cooked with lentils, onions and peppers in olive oil, Patlicanli Mercimekli Mualla during our Turkish Cookery course. 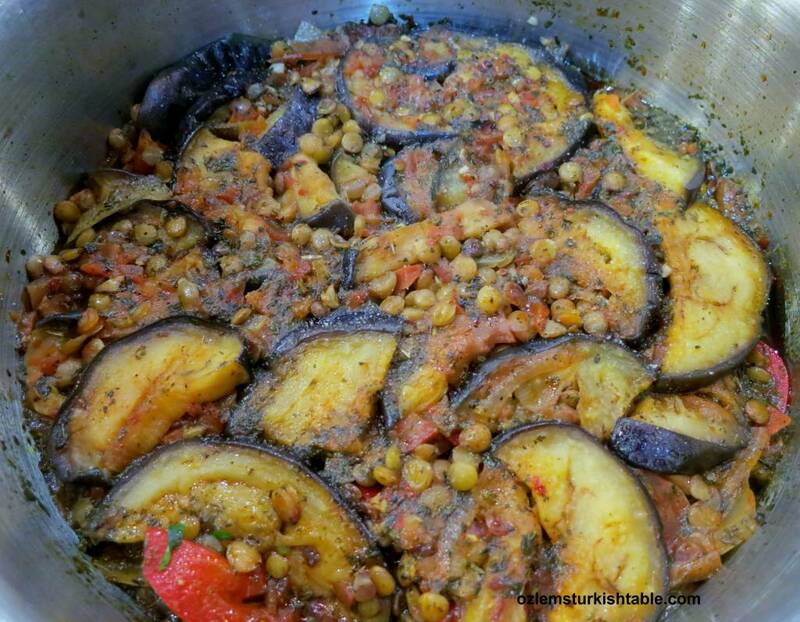 Marriage of lentils with eggplants and vegetables are heavenly in this dish and dried mint gives a delicious, refreshing finish – a personal favorite, became hugely popular at the class. 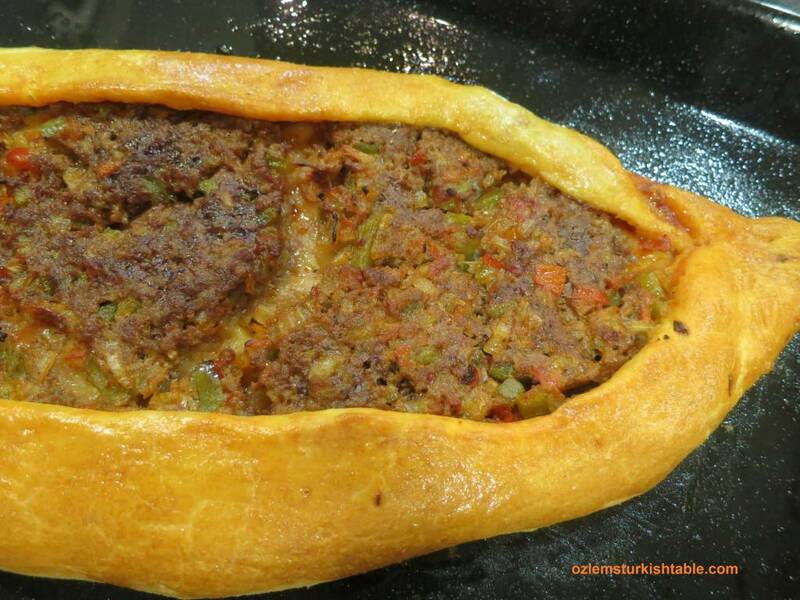 Turkish oval flat breads with ground meat and vegetables topping, Kiymali Pide was another highlight from our course. My version includes a lot of onions and peppers, a lovely juicy topping, if you’d like to have a go too. 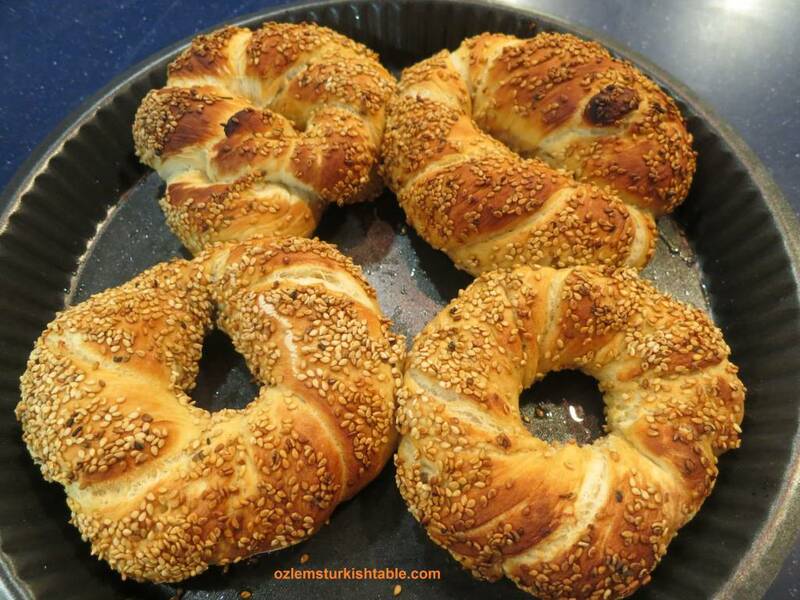 Simit, sesame encrusted bread rings is the ultimate street food in Turkey and it was wonderful to recreate this much loved snack during our course in Amman and we all enjoyed the results! 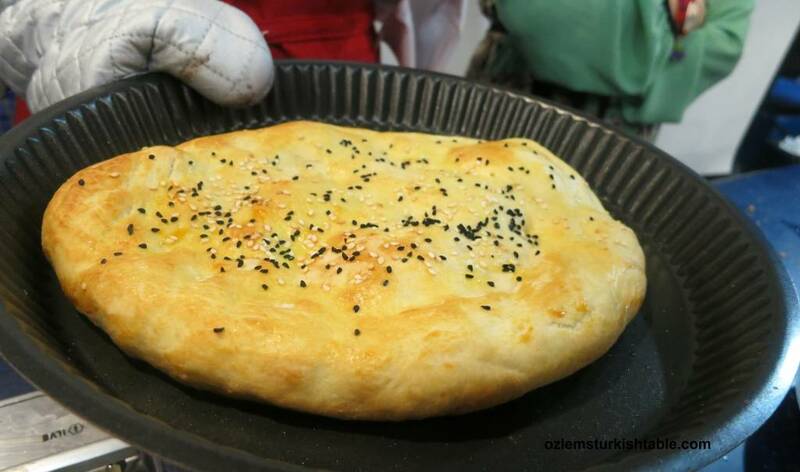 Making Simit, sesame – encrusted bread rings, during our Turkish cookery course in Amman. Here comes our Simit, sesame encrusted bread rings! Jordanians are a very hospitable nation, everyone has been so kind, generous with hospitality high on the agenda. My huge special thanks to especially dear Suhair Kilani and the Panthera Jordan team for their amazing hospitality. 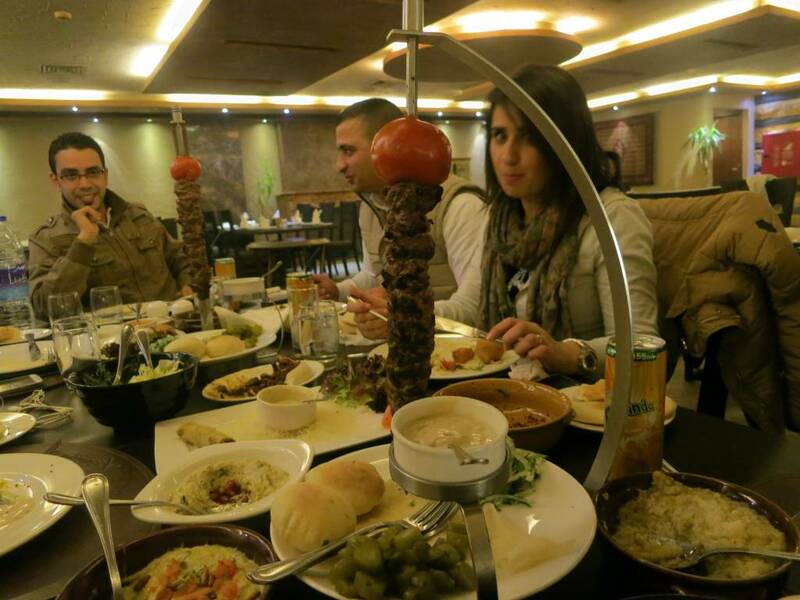 Thanks to them, I got to experience the Jordanian food scene at its best. 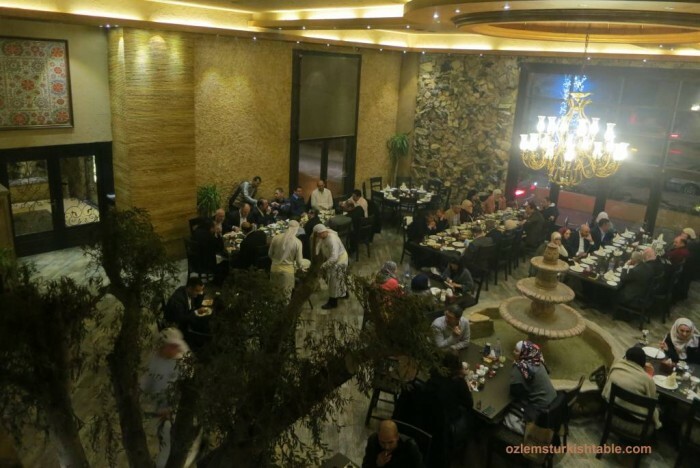 The traditional Jordanian meal we had at the Rajeen Restaurant in Amman was very special, the atmosphere was unforgettable. 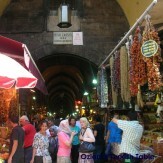 I really enjoyed the food and the variety of the mezzes. 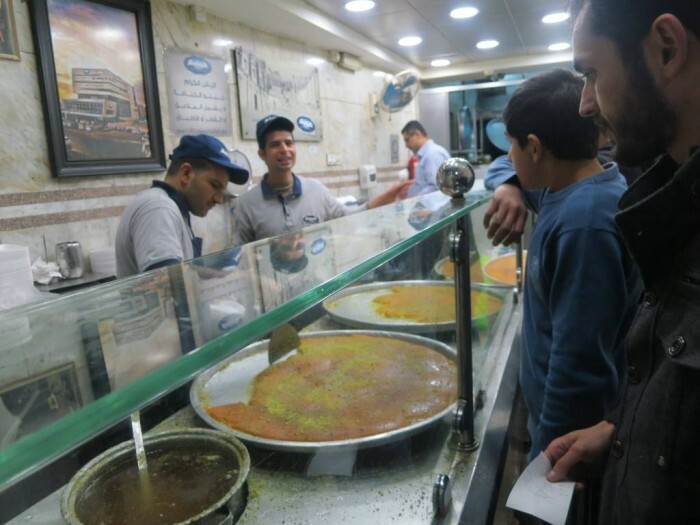 Their hummus is much creamier than ours and we found the secret – they add strained yoghurt to their hummus, a delicious addition. 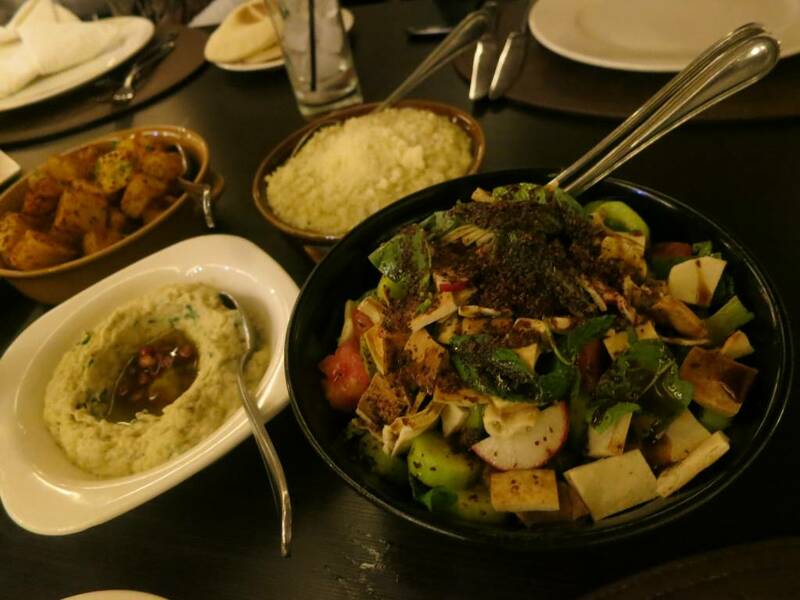 I loved the Fattoush salad with toasted bread and sumac dressing, packed with flavor, could have eaten just that all night. Could you believe this beautifully painted piece of work is a hand wash basin? Dear Suhair and her husband Ma’en also very kindly took me some fabulous local eatries like this local Kunefe shop, it was well worth queuing for an amazing kunefe! Back to our course, after teaching and sharing 22 delicious Turkish recipes, we gave our participants Certificate of Attendance. 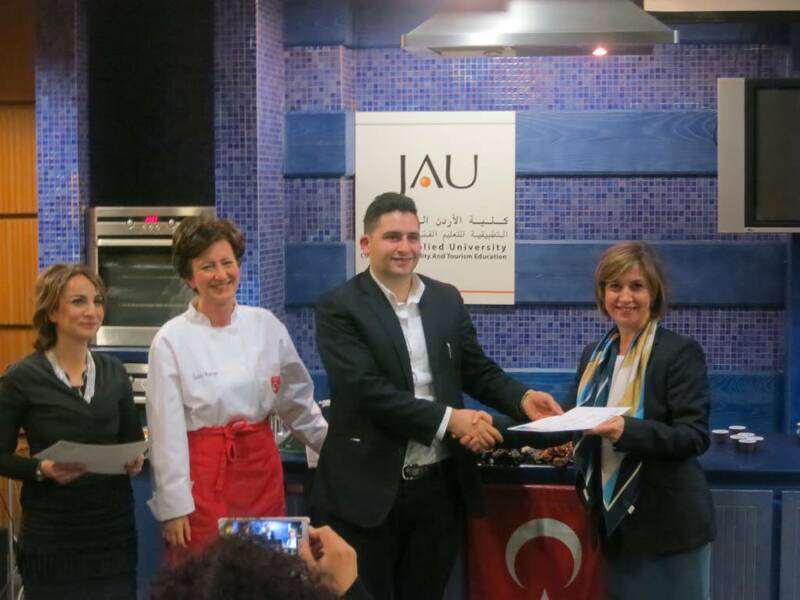 We were delighted to have Mrs Onal, wife of Turkish Ambassador, Mr Onal for Jordan with us. My sincere thanks again to dear Suhair Kilani for organising our course in Amman, Jordan, all Panthera Jordan Team, JA University and the Turkish Embassy in Jordan for all their support. 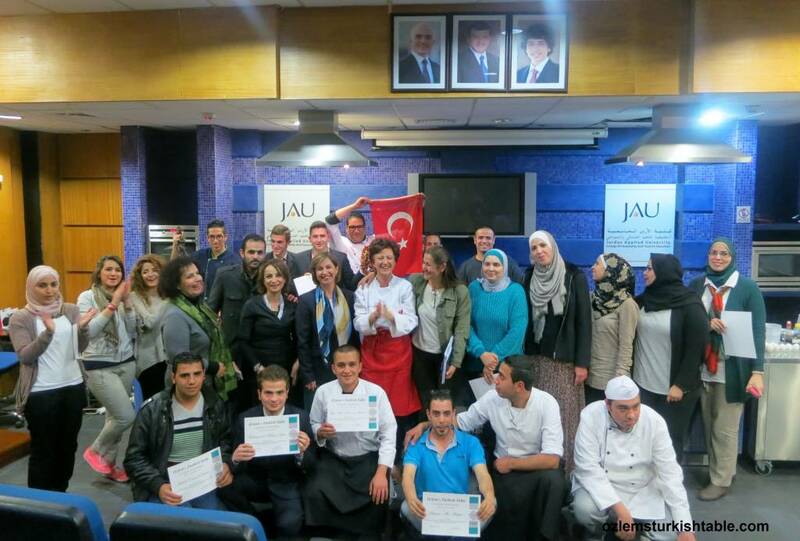 Giving attendees their Certificate after our course, with Mrs Onal from Turkish Embassy in Amman – Jordan. 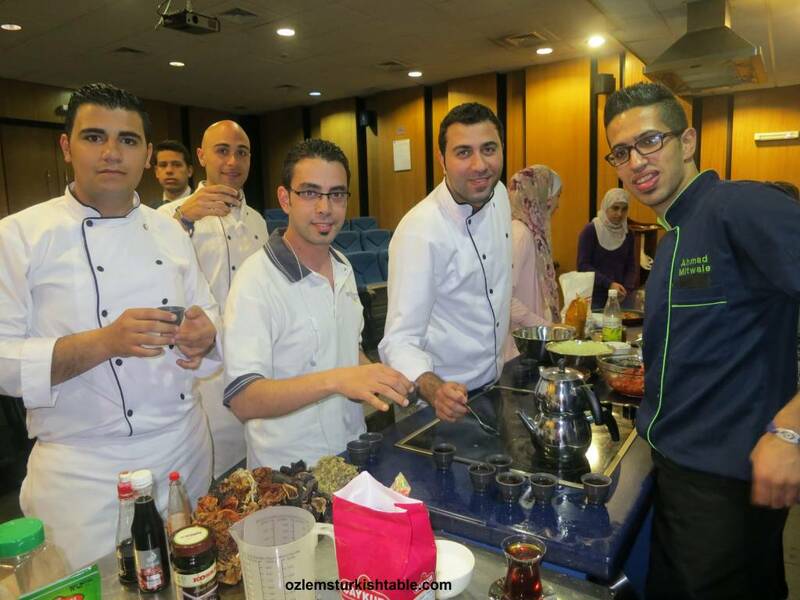 Group photo at the end of our 5 day Turkish cookery course in Amman, Jordan. 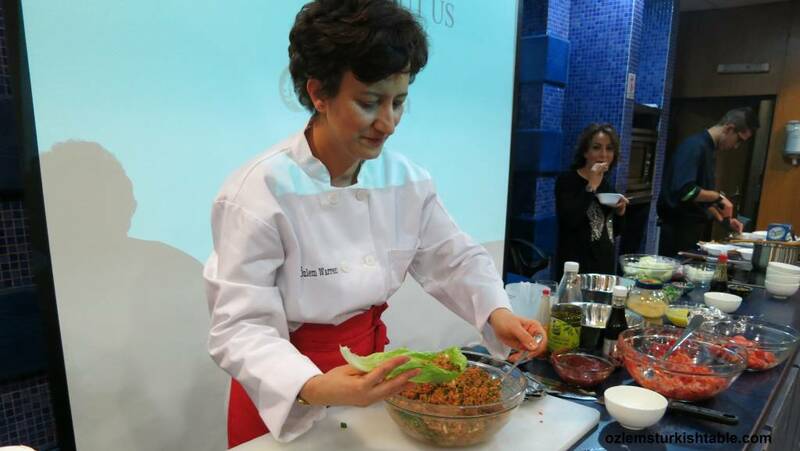 Our Turkish cookery course in Amman aired on TRT! It was a wonderful series of Turkish course to remember, I very much look forward to returning for more Turkish cookery classes, many thanks Amman, Jordan! 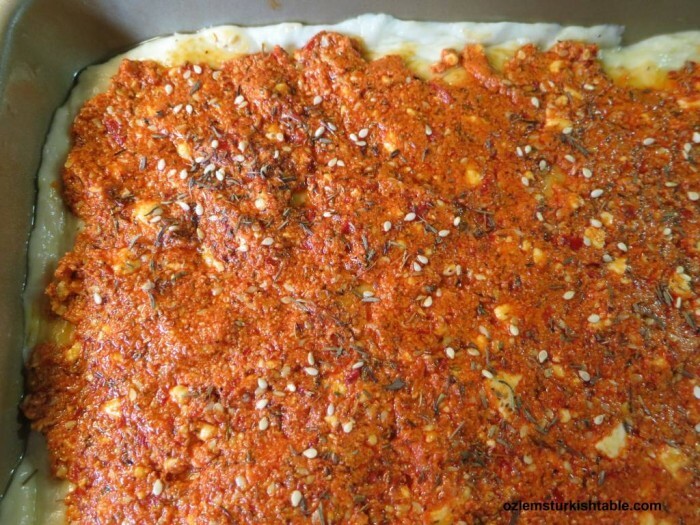 This delicious flat bread with spicy red pepper paste, biber salcasi, feta cheese and za’atar or zahtar spice blend is a specialty from the Antakya cuisine and brings special memories back. 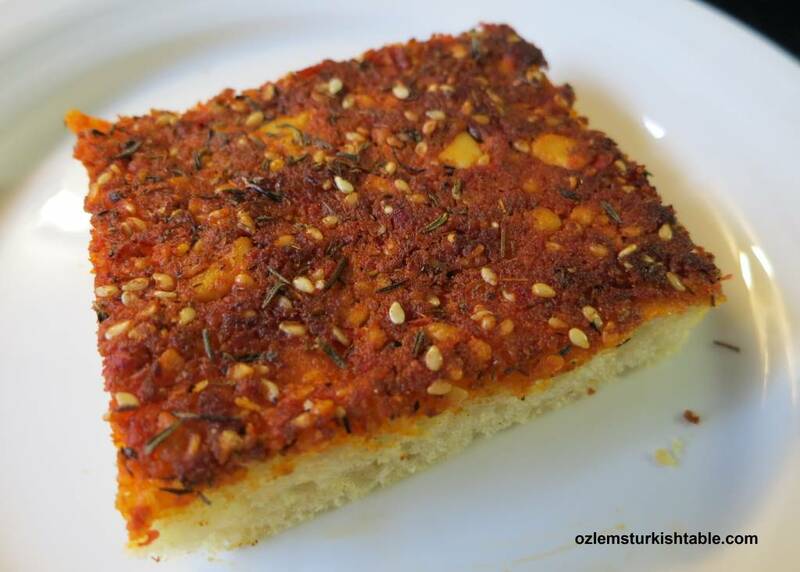 I remember my grandmother and mum preparing the delicious topping at home and we children would take it to the local bakery, firin, to be baked over flat breads. They always smelled mesmerizing and we couldn’t wait to have a bite (or two). Fresh Zahter or Zahtar is a popular herb grown in southern part of Turkey, especially around Kilis and Antakya in spring. Fresh zahter looks more like summer savory, or a crossing of marjoram, oregano and thyme. This herb is wonderful on salads like this Zeytin Ufeleme, Olive salad with pomegranate molasses and zahtar. 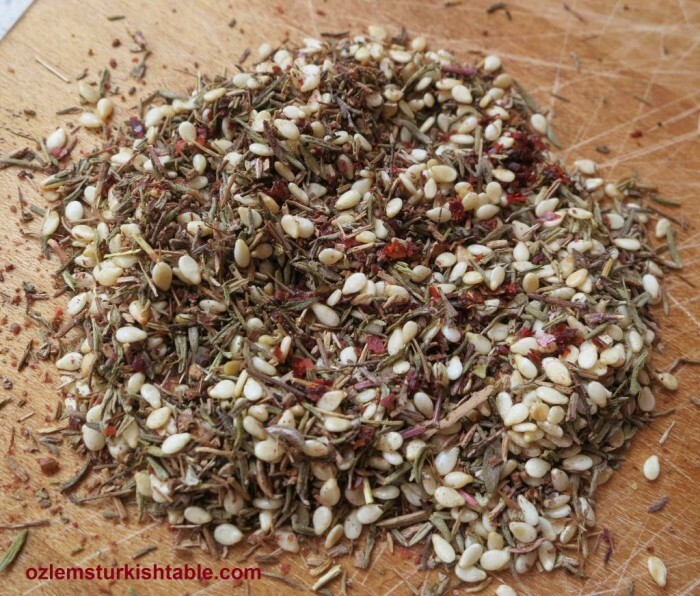 Za’atar is also the name given to the exotic blend of herbs, spices and nuts, widely used in Southern Turkish as well as Middle Eastern cooking. At my home town, Antakya, zahtar blend is a rich mixture of dried zahter, sesame seeds, crushed cooked chickpeas, cumin, nigella seeds, sea salt, sumac and many more. 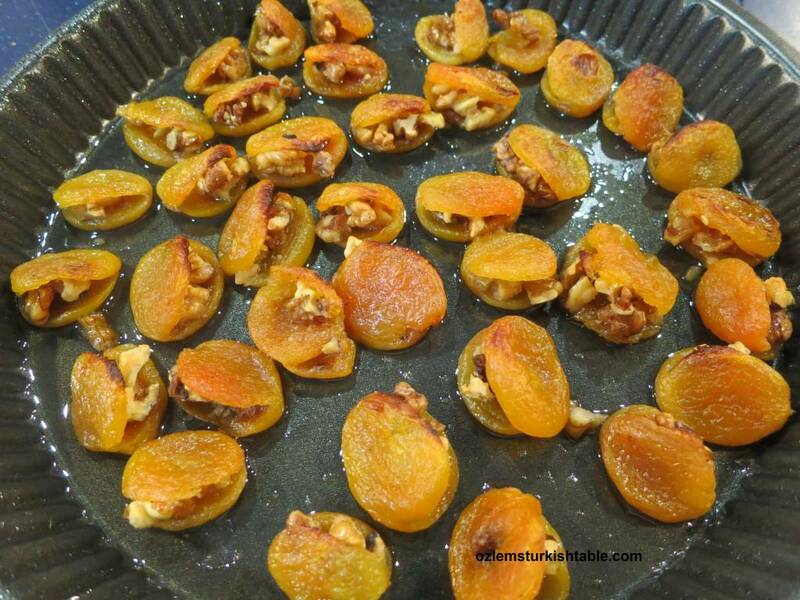 It has a lovely, pungent, nutty taste and flavors salads, meat, and vegetables beautifully. 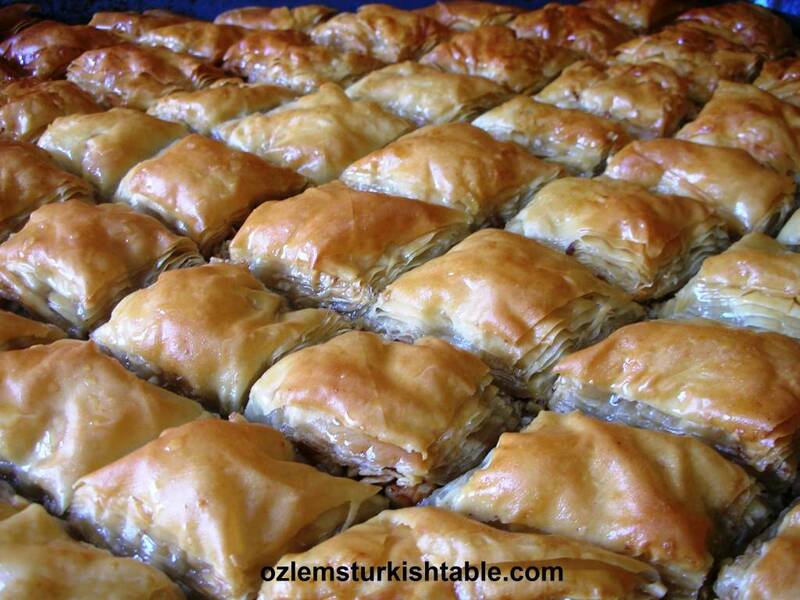 In Antakya, locals simply dip their bread to a bowl of olive oil than to this zahtar blend for a delicious breakfast. 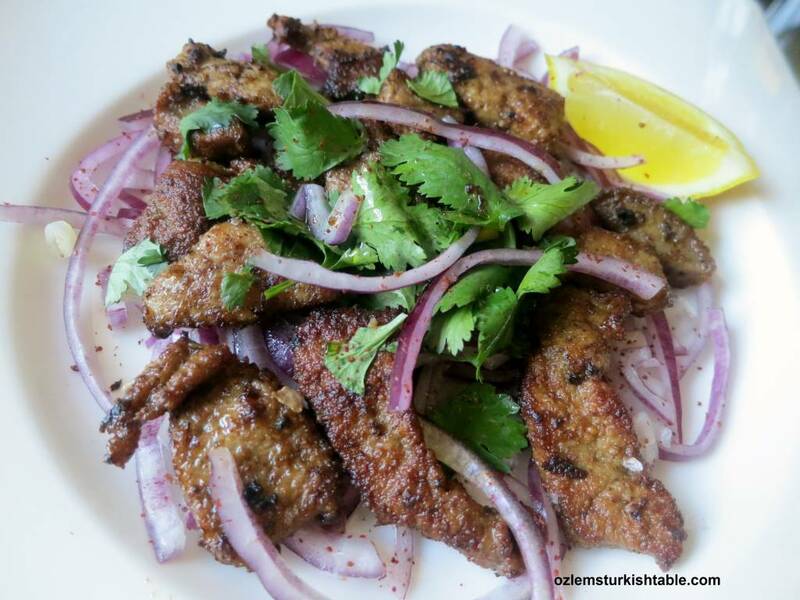 I now see wholesome zahtar available even in supermarkets these days, you can also make your own zahter or za’atar blend, here’s my recipe. Spread the topping over the flat bread and let the dough rise for 30 minutes. These delicious and healthy flat breads also feature Antakya’s much loved olive oil, Turkish hot pepper paste, biber salcasi and crumbled feta cheese, cokelek. Combined with zahtar, sesame seeds and cumin, it makes a scrumptious, wholesome and fragrant topping for the flat breads. There is a delicious heat from red pepper paste, biber salcasi, a staple in Antakya cuisine and in my kitchen, which add so much flavor. 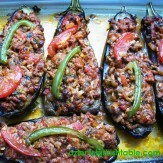 You can make your own red pepper paste, biber salcasi with my recipe; it really is worth the effort. If not, you can add red pepper flakes, mixed with tomato paste instead. 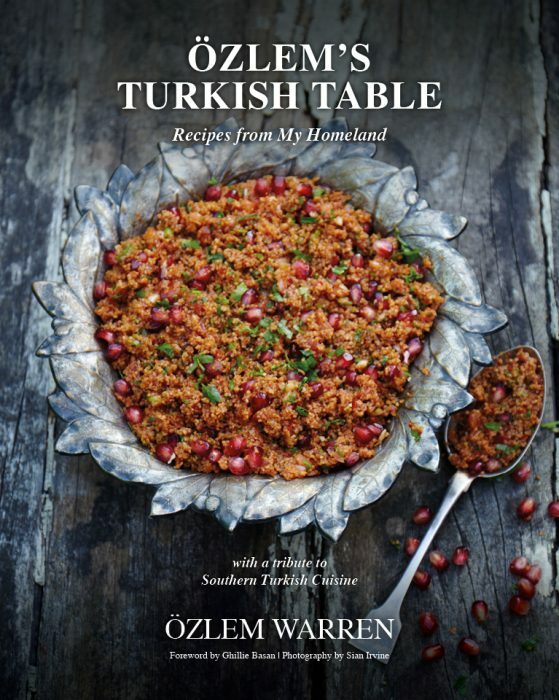 I hope you enjoy Biberli Ekmek; it is delicious served as a mezze (try with hummus, muhammara, cevizli biber – red pepper paste and walnut dip or with cacik, yoghurt dip with cucumbers and dried mint), accompanies tea time, soups and main courses so well. 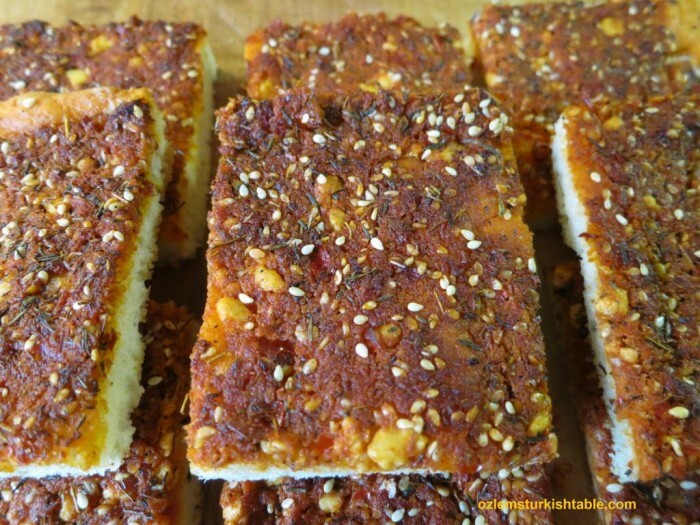 I hope you enjoy Biberli Ekmek; Turkish flat breads with crumbled feta, red pepper paste, sesame seeds, spices and zahtar blend. 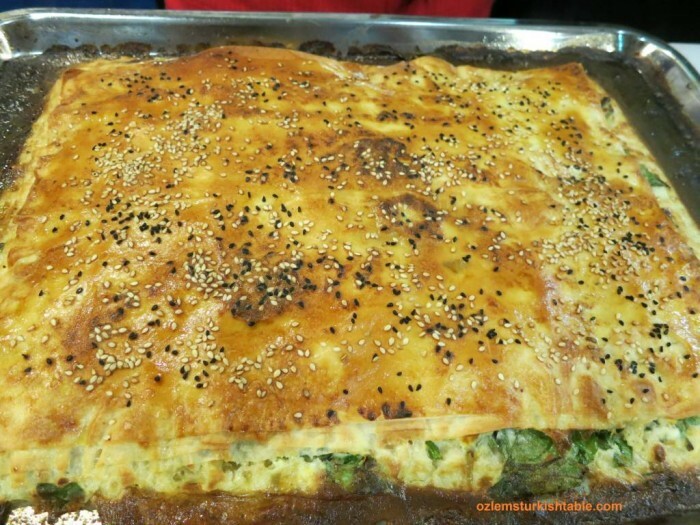 This easy recipe from Antakya, southern Turkey also showcases region's wonderful olive oil and crumbled feta, cokelek. 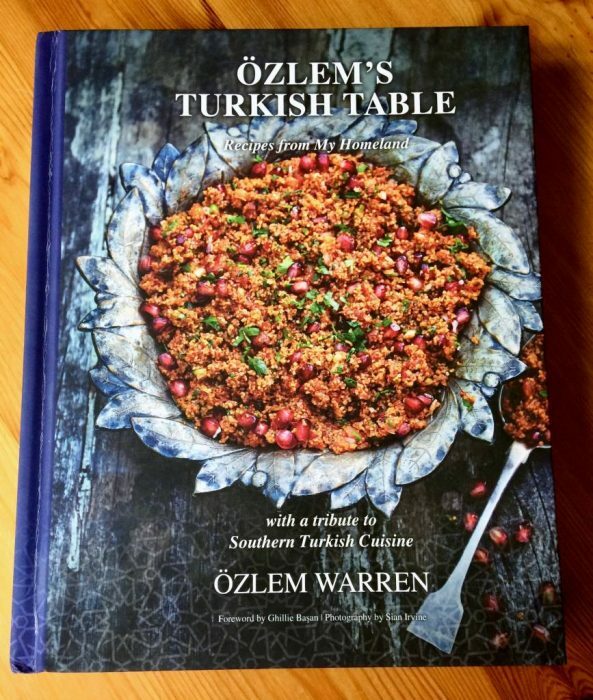 Delicious and wholesome; try as a mezze (try with Hummus, Muhammara – red pepper paste and walnut dip or with Cacik, yoghurt dip with cucumbers and dried mint), or at tea time, with soups and main courses. Prepare the topping first. Combine the crumbled feta (or cokelek), red pepper paste, tomato paste all the spices, sesame seeds and olive oil. Knead with your hands to blend them well to form a smooth paste. Set the topping aside. Now let’s make the dough. Combine the flour, dried yeast and salt in a large bowl. Stir in the warm milk, warm water and olive oil and knead for 3 minutes to form a soft dough. If it gets sticky, drizzle a little extra olive oil in your hand to shape the dough, it really helps. Grease a baking tray with 1 tbsp. olive oil and spread the dough as a thin flat bread base, reaching all the edges (about ¼ cm, 0.9”). Spread the topping evenly over the flat bread. Leave the flat bread with topping on at a warm spot to rise for 30 minutes. Once the dough's risen, bake in the preheated oven (180 C / 350 F) for 18 – 20 minutes. Let the baked flat bread with spicy feta cheese topping, Biberli Ekmek to cool down for 15 minutes. 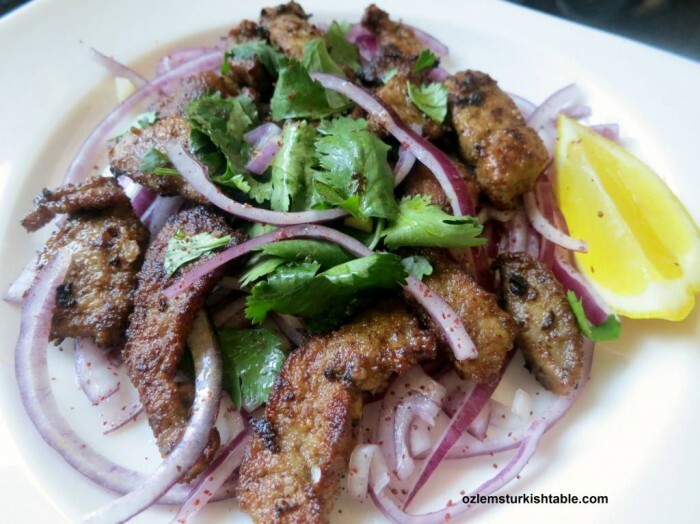 Slice and serve as part of a mezze spread or with tea, Turkish cay.